Guess how old Dr. Coreen Copuyoc is? Time to take notes! 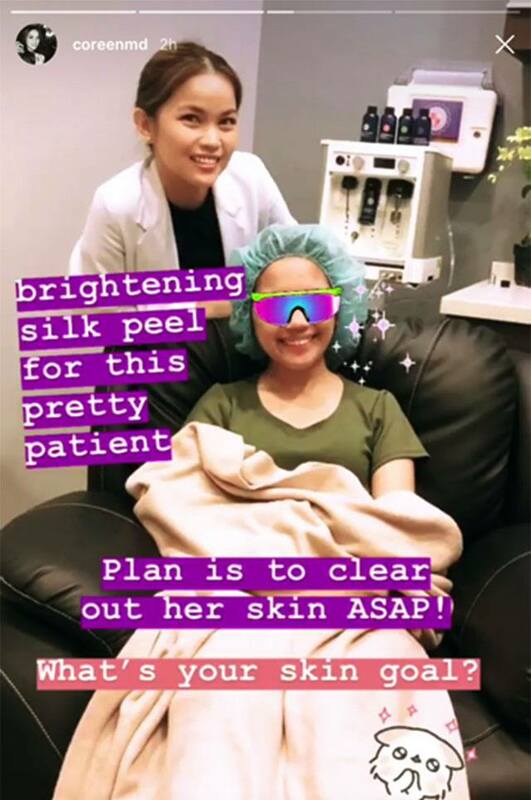 One look at dermatologist Dr. Coreen Copuyoc and you wouldn't think that she's already in her 30s. In fact, it’s easy to mistake her for a student, or anyone who lives a pretty chill lifestyle. It doesn’t help that her Instagram feed shows a curation of stunning landscapes and picture-perfect travel LOTDs. So, of course, we just had to find out what her beauty secrets are for travel, on top of the everyday skincare tips she posts on her IG stories. Below, our chat with Dr. Copuyoc. When did you start becoming conscious about skincare? When I was 15, I suffered from cystic acne. I had it on my chest and my chin. I told my mom about it and she told me to put toothpaste on my skin. (Laughs.) When that didn’t work out, we consulted my friend’s mom who’s a dermatologist, and she helped my skin situation and taught me the basics of proper skincare. After that, I started checking out skincare products in the market. But I only seriously pursued a career in dermatology in college, when I shifted from BS Management-Honors to BS Biology in my freshman year at the Ateneo De Manila University. What made you start sharing your travel and derma stories publicly? I first tried blogging in my first year in med school, but I stopped that same year because I really didn't have the time. That has been my frustration, actually—I can’t help thinking that my blog could’ve been successful. There weren't many bloggers then, and I already had a good number of readers who were commenting on my posts. But I have no regrets. I had to focus on medicine to maintain my scholarship! That didn't stop me from documenting my travels, though. At the time, I was fortunate enough to be taken on many trips by my family. After finishing residency, I finally had the time again to share my two passions—traveling and skincare—on social media. I’ve always enjoyed expressing my creativity, and this shows in the way my social media feed is curated. I never planned on becoming an influencer, though. I just wanted to share my experiences and write about my interests for creative documentation. As an avid traveler, how do you adjust your beauty regimen to defend your skin against the harsh elements and fluctuating temperatures? I hydrate my skin by drinking a glass of water every two hours when I'm on a plane. I apply sunscreen with at least SPF 30 (and reapply when I sweat or swim), and use moisturizer in the morning and at night—I apply it upwards to help my skin fight against gravity. I slather extra emollients when I'm in extremely cold places, and I refresh my skin with cooling sprays in tropical destinations. Lip balm with SPF is also a must. For makeup, I make sure to use non-comedogenic, hypoallergenic, and fragrance-free products since I have sensitive skin. I also take an acne spot treatment and a pack of makeup remover wipes with me. I transfer my products into travel-friendly containers and always carry a kit filled with these essentials. How would you describe yourself as a dermatologist? What do you think makes you stand out? My main objective is for people to be able to improve their skin without having to overspend. I always try to get to know my patients down to the smallest details—their regimen, their eating habits, and their day-to-day lives. That helps me and my patient formulate a plan that involves tweaking the skincare routine first. Then I ask them to visit me after a few months to see if there are any improvements. If the problem persists, that’s when I start recommending more advanced procedures and laser treatments. I think what sets me apart is that I make sure that the treatments are tailored to my patients. I make sure to listen to their skin goals. We start with the basic problems first; once we cure those, I give them the option to raise their goals for their skin or over-all look. Aside from wanting my patients to be comfortable in their own skin, I also want them to fall in love with their skin and be confident with themselves. 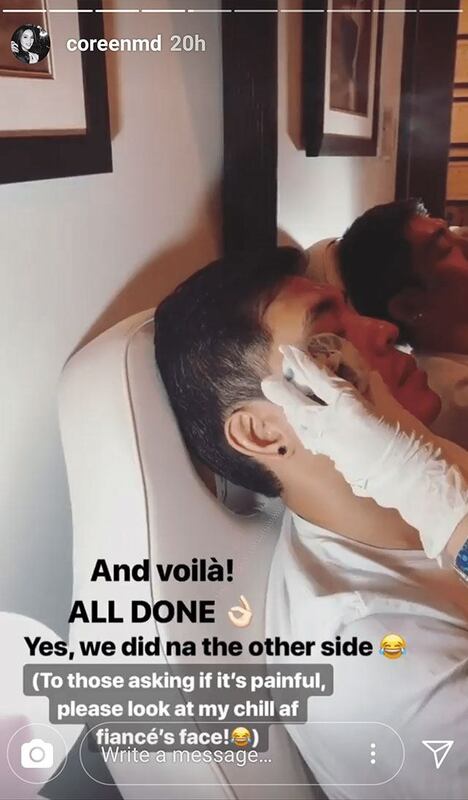 We saw in your recent IG stories that you were doing a treatment on your fiance’s face. Can you tell us more about that? Oh, you saw that! (Laughs.) It's called Xeomin. 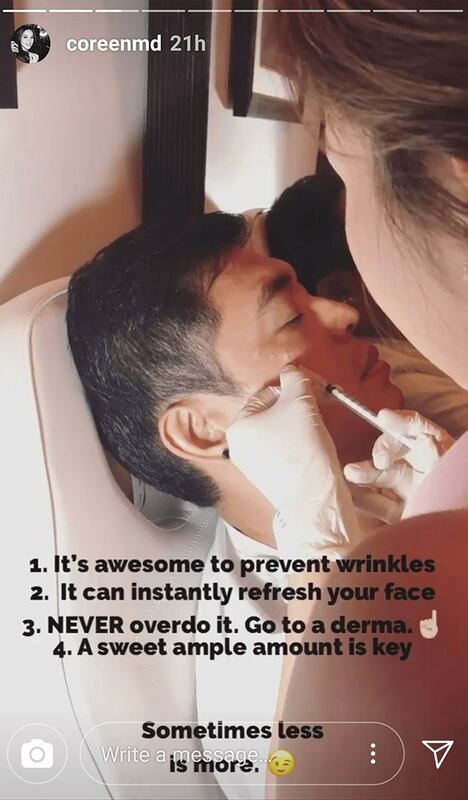 It's one of the new and advanced treatments I’m exploring right now to help my patients who are concerned with aging and want to look fresh and rejuvenated, especially when a big event is coming up—in my fiance's case, it's our wedding! Xeomin is a pure neurotoxin that removes fine lines and wrinkles on the face. In a nutshell, neurotoxins are muscle relaxants that help lessen fine and deep-set lines on the skin. 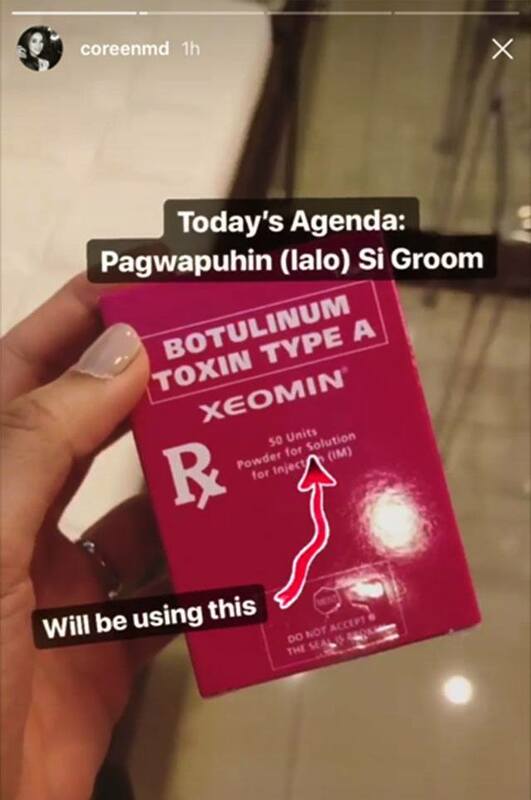 If you see lines on your forehead, in between your eyebrows, or around your eyes that you're not fond of, you can try Xeomin as a way of reducing and preventing them from becoming permanent. My fiance was hesitant at first to try it, but he ended up really happy with the results. It's funny how many people have the wrong impression about neurotoxins, but all of them want to learn more. When should one visit her derma instead of relying on over-the-counter skincare products? When you know your skin and don't really have bothersome skin conditions, you can easily find out which products suit you best. I’m not against people exploring and having their own skincare routine, as long as you do your research and get information from reputable sources. But if you struggle with acne and other stubborn skin conditions, I highly suggest going to a dermatologist right away. It will save you time and money by preventing unnecessary stress from added or worsened skin problems in the long run. Also, something I vehemently advise against is buying over-the-counter peels, because they can burn your skin. Make sure to leave the peels to a professional. How do you take care of your skin daily? I’ve always been about maintaining a simple yet effective and consistent skincare routine. I use a good cleanser, an anti-acne gel, an anti-aging moisturizer, and sunscreen daily. When I wear makeup, I make sure to remove it thoroughly at night with makeup remover wipes to prevent cosmetic acne. Your wedding’s fast approaching. Do you have any special preps for the big day? 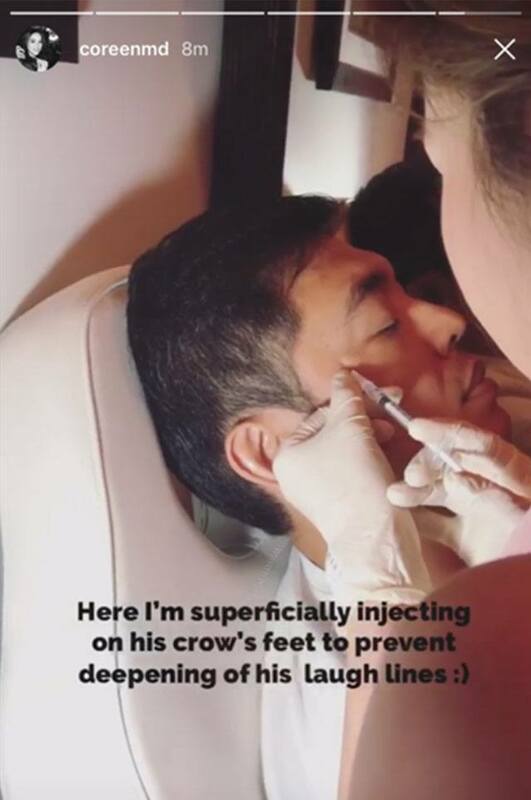 Aside from being extra consistent with my skincare regimen, I’ve started a self-curated skin program consisting of quarterly SilkPeel Dermal Infusions and photorejuvenation with Q-switched laser. I’ve started taking anti-oxidant supplements too. I've also been staying away from alcohol and secondhand smoke, and have been trying to control my sweet tooth! That last bit is the hardest. What's your advice to Cosmo girls who want to take better care of their skin? Have a good skincare regimen as soon as possible. Prevention is always better than a cure, and that saying applies to our skin too. Always make smart and informed decisions when it comes to what you put on your face. Consult a dermatologist about new products you want to try, or at the very least, do your research properly. Invest in your skin—it will represent you every day for the rest of your life. Dr. Coreen Copuyoc practices dermatology at St. Luke’s Medical Center in Bonifacio Global City, Taguig. Follow her on Instagram. This article was created by Summit Storylabs in partnership with Ultherapy.